I was walking in the produce section of the store the other day when I saw a package of what looked like 4 apples in a plastic container. I stopped to look at it, and noticed it said "Grapple." I continued to read the package where it is said "Looks like an apple, tastes like a grape." I was confused at this point of how two fruits were combined into one. I read further to find out that this apple had been infused with artificial grape flavoring. I couldn't believe it! There are so many things that have artificial flavorings and coloring. However, fruits and vegetables are the one thing I thought were safe (besides possible pesticides and such they may put on them). However, even our produce now has artificial flavorings inside of them. 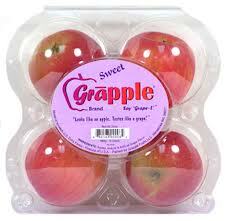 While some people may think fruits are good for you, so Grapples must be good for you - watch out! Read the labels and find out what you are really putting in your body.